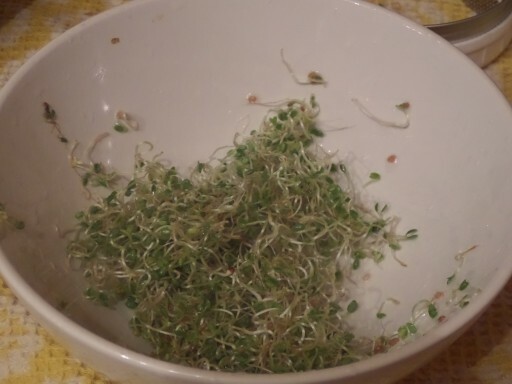 Okay, so this isn’t what most people think of when they think Do-It-Yourself, but it is super easy to grow your own sprouts, and they are super nutritious to boot. Sprouts get a bad rap sometimes due to salmonella and e. coli outbreaks. I was super sad when Jimmy John’s stopped using them on their sandwiches. But when you grow your own, there is almost no chance of contamination. 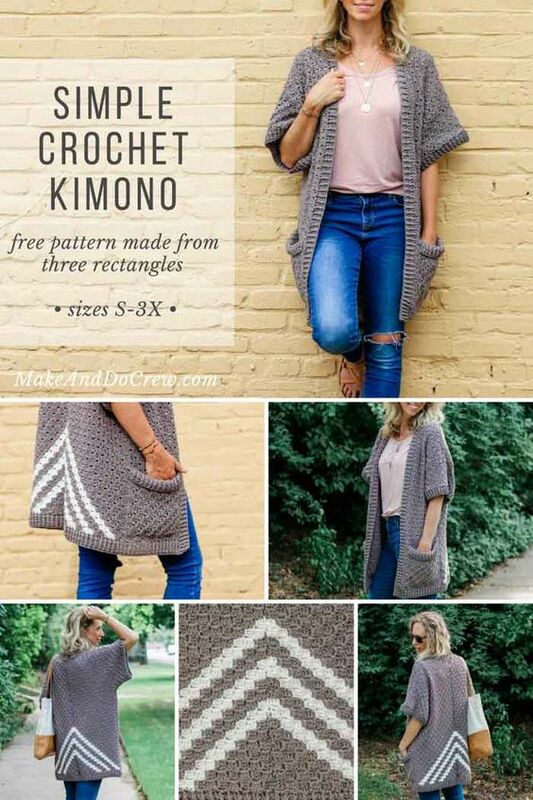 And all you need is a jar, cheese cloth, and water. Well, and seeds, course. In 6 days you’ll have a whole harvest of sprouts to put on the salad or sandwich of your choosing. So here is my sprouting setup. 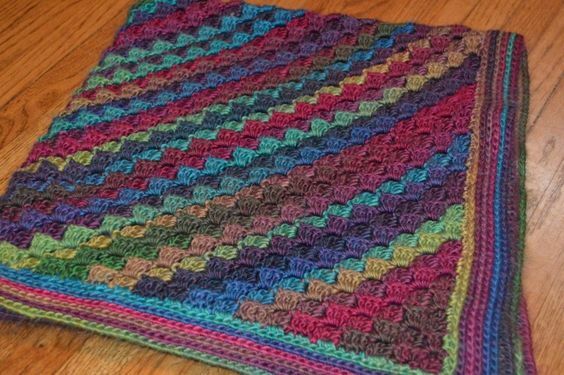 It is nothing fancy, but it still more than you actually need. After growing a few batches with just a jar and cheese cloth, I sprung for a lid with metal screens, just because the soggy cheese cloth was kind gross. I got my supplies, ans well as a whole lot of good information from the Sprout People. They know everything they’re is to know about sprouting, sell all sorts of sprouters if you’d like something more advanced than a mason jar, and the best part, they sell gourmet mixes of sprout seeds. 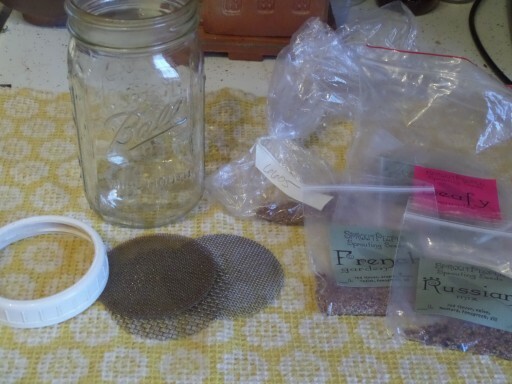 I started with plain alfalfa sprout seeds I found at the local natural foods store, but when I ordered my mesh screens, I decided to try a sampler pack of the seed mixes from the Sprout People. 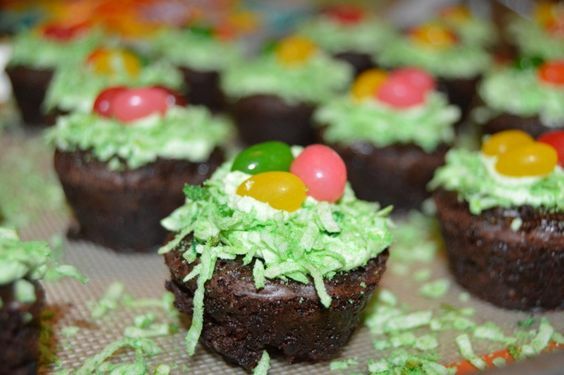 I can highly recommend the mixes, they have much more complex flavor combinations. My favorite are any with radish, makes them a bit spicy. They are spectacular on a sandwich. Okay, to get started actually sprouting these seeds, we need to soak them for 8 hours. I usually soak them overnight. The seeds are dormant, the soak wakes them up. 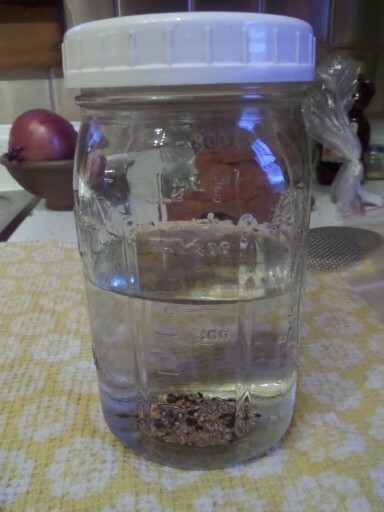 Place your desired amount of seeds in your jar, fill the jar with water, and shake it up really good. The seeds have a tendency to stick together and float on the surface. You need to make sure all the seeds are actually getting wet. 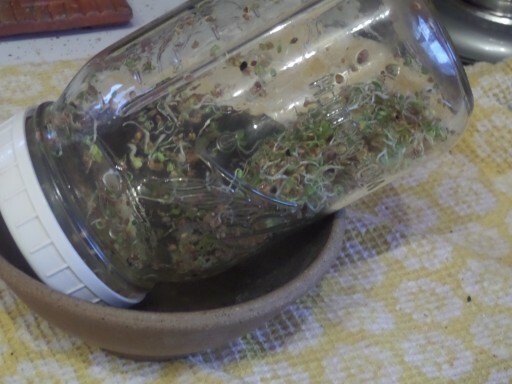 You can put up to 4 tablespoons of seeds in the jar and still have room for them all to sprout, but I can’t eat them that fast, so I usually just do a tablespoon or two at a time. Once the seeds have soaked for 8 hours, dump the water out. This is where the screen or cheese cloth is necessary, you need the seeds to stay in the jar but the water to leave. Rinse the seeds again, swish the water around, then dump it out. 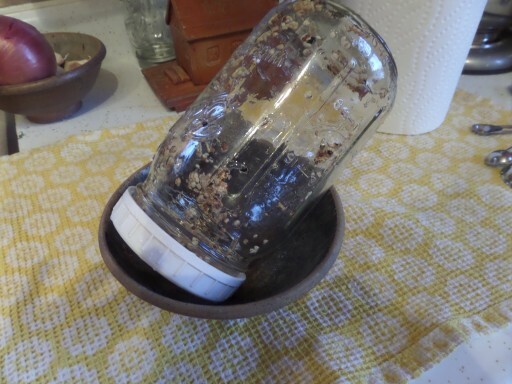 Shake out all the water you can, then leave the jar propped in a bowl so any remaining water can drain out. Make sure there is enough airflow so the seeds can dry. That’s it, you just repeat the wash, rinse, drain routine twice a day until the sprouts are ready, six days. In between rinsing, just leave the jar propped in the bowl on the kitchen counter, out of direct sunlight. After a day or so, you’ll see the seeds start to sprout. The screens I have a great because they come in 3 sizes, a fine mess for the first 2 days, before the seeds sprout. Once the sprouts start to grow, you can move up to the larger mesh. It makes it easier to drain the water. But like I said, if you don’t have any fancy screens, cheese cloth over the jar works just fine. 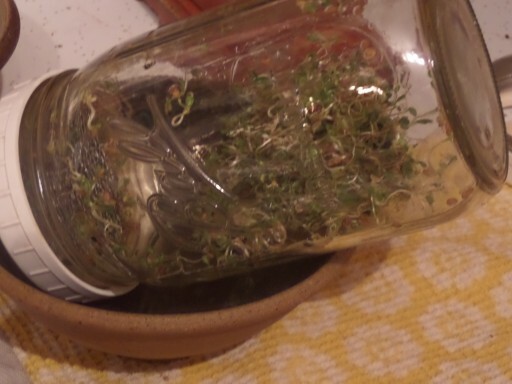 I mentioned that I don’t sprout a very big batch at a time, as you can see in this picture there is plenty of room left in the jar. I’ve done larger batches where the whole jar is full by the end of the 6 days. Just make sure when you rinse that you swirl the water around so all the sprouts get wet, then make sure to shake the water out really well. 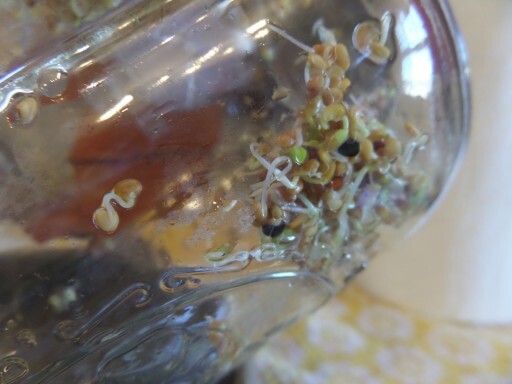 If you leave water in the jar the sprouts will start to rot. So here we are at the end of Day 6, these babies are ready to harvest. 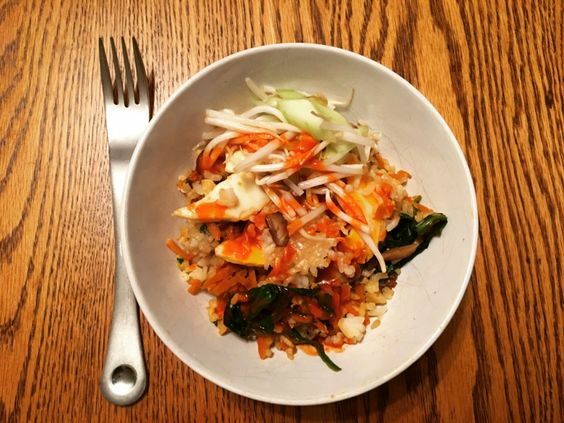 All you need for that is a bowl. 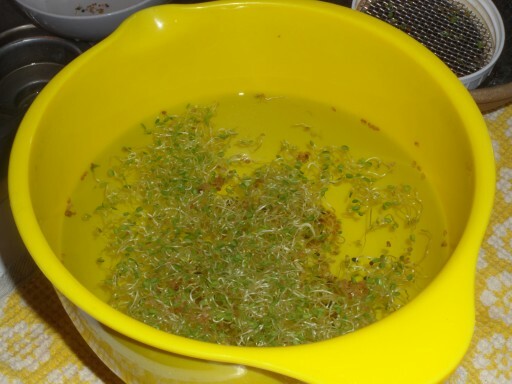 The sprouts end up floating, so I just rinse them out of the jar, into the bowl and gather them off the top. The hulls and any unsprouted seeds sink to the bottom. If you have a small salad spinner it can make short work of this step, with the bonus of being able to spin the sprouts dry. If you don’t spin them, make sure the leave the sprouts out on the counter until they are completely dry, then store them in the fridge in a ziploc bag or tupperware type container. 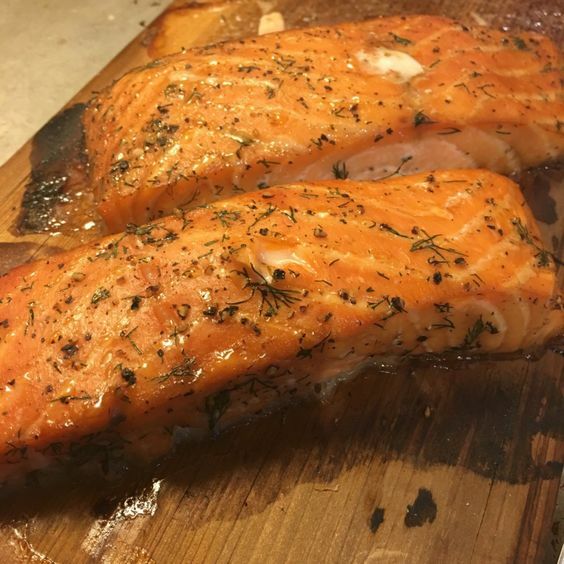 They keep for a long time as long as they are dry before they go in the fridge. 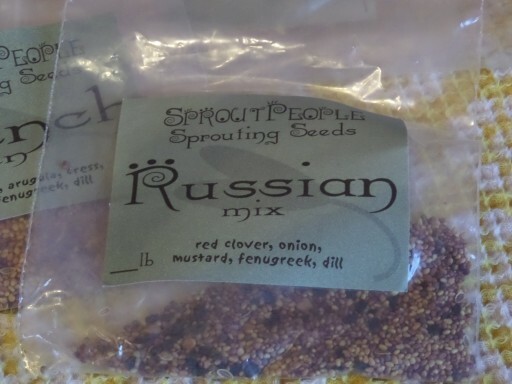 If you had a full batch, the sprouts in the center of the jar may have yellow leaves instead of green. While they are drying, leave them in the sun and they will green right up. Otherwise, just eat them yellow, they don’t taste any different and they are just as nutritious as the green ones. Then make yourself a delicious sandwich with some healthy, delicious sprouts. 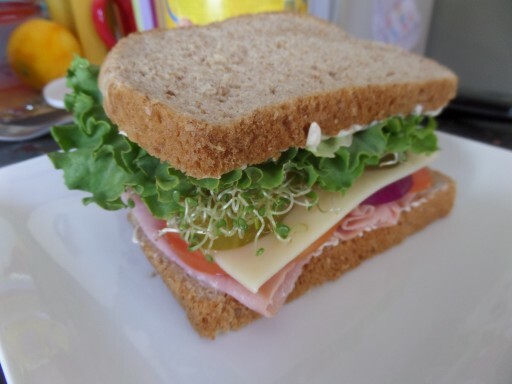 My favorite is ham and swiss, with tomato, red onion, pickles, mayo, horseradish mustard, lettuce and sprouts. 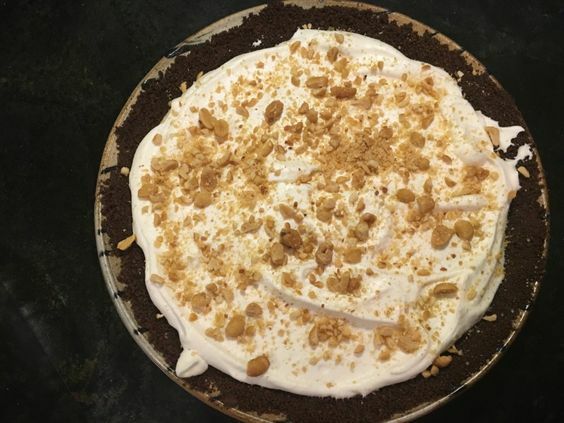 Did I mention that I like toppings? 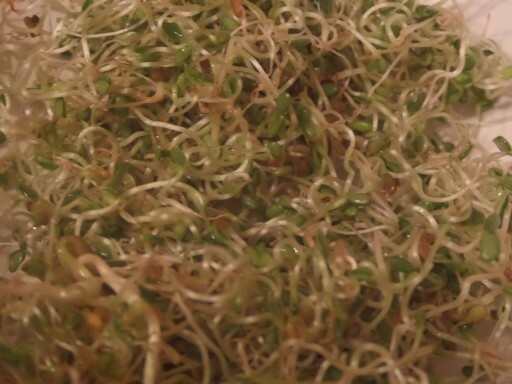 Sprouts are also delicious on a salad, or burger, or anywhere you might use lettuce. 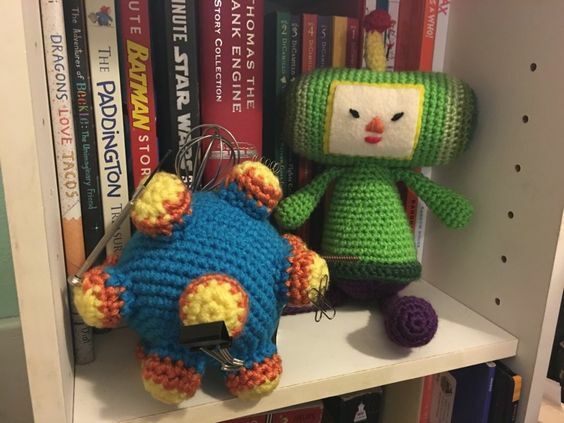 Really, they are fabulous. You should grow some right now.